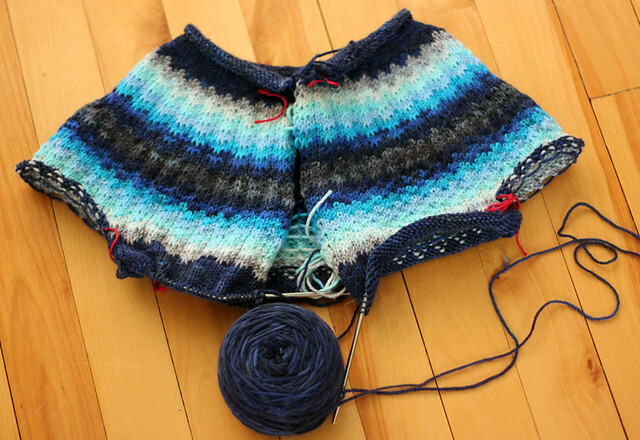 I'm working away on my Sky Palette sweater. I sailed through the colourful yoke and am now working on the stockinette body. I'm not 100% certain how this cardigan is going to look when it's finished. I cast on using a provisional cast on so I can decide how to finish the neck edge later. I think it will have pockets and a zipper, and likely a touch more zigzag on the cuffs or something, but for now I'm just winging it. The chevron style of the stripes in the yoke is achieved with slipped stitches, so I'm only ever working with one colour at a time, which makes for a really easy knit. It looks kind of bumpy now, but that will all be smoothed out in the end with blocking. The K-W Show is this weekend, we leave on Friday and have officially hit that point where if it's not done yet, it's not going to get done! It's a funny feeling. I feel like this last week leading up to the show should be the most chaotic, and though it does include it's share of last minute organizing all the major work (the dyeing!) is done. Hopefully that means I'll have more free time to spend working on this sweater!